Arthroscopy is a surgical procedure in which an arthroscope is inserted into the hip joint to assess and repair damage to the hip. 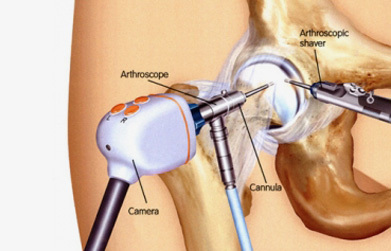 The arthroscope used in Hip Arthroscopy is a small fibre-optic viewing instrument made up of a tiny lens, light source and video. The surgical instruments used in Arthroscopic surgery are very small (only 3mm to 4mm in diameter) but appear much larger when view through an arthroscope. The camera attached to the arthroscope displays the image of the joint on a screen, allowing the surgeon to look throughout the hip joint. The surgeon can then determine the amount or type of injury and repair or correct the problem as necessary. Debridement of loose bodies – Bone chips or torn cartilage debris cause hip pain and decreased range of motion and can be removed with hip Arthroscopy. Removal of Adhesions – Adhesions are areas on built up scar tissue that can limit movement and cause pain. Repair of torn labrum – The labrum lines the outer edge of the “socket” or acetabulum to ensure a good fit. Tears can occus in the labrum causing hip pain. Removal of bone spurs – Extra bone growth caused by injury or arthritis that damages the ends of the bone cause pain and limit joint mobility. Partial Sycovectomy – Removal of portions of the inflamed synovium (joint lining) in patients with inflammatory arthritis can help to decrease the patients pain. Evaluation and diagnosis – Patients with unexplained pain, swelling, stiffness and instability in the hip that is unresponsive to conservative treatment many undergo hip Arthroscopy for evaluation and diagnosis of their condition.